The chain Hard Rock Cafe comes from the USA and has branches in many countries around the world. They are actually more restaurants or bars than cafes. There is great American and international food in large portions. In addition, there is usually good rock music and lots of beer and other alcohol. In some Hard Rock Cafes also bands perform live. In Italy there are three branches of the international chain, namely in Venice, Florence and Rome. This article is about the Hard Rock Cafe in Rome. In every Hard Rock Cafe there is also a shop. In Rome it is directly behind the entrance to the restaurant. Here you can find the world-famous T-shirts, sweaters etc. with the inscription Hard Rock Cafe and city name in English, in Rome of course „Hard Rock Cafe Rome“. These T-shirts are available in different colours for 28,90 Euro (February 2019). There are also some other cool clothes and souvenirs. For example, for dinner in the Hard Rock Cafe there are huge hamburgers, really American. Of course you can also order other main courses and starters. These include pork ribs, salads, pasta and chicken wings. The next metro station is Barberini, then about 200 meters on foot up Via Vittorio Veneto, the cafe is then on the left. You can also walk from the nearest metro station „Spagna“ (about 300 meters). Spagna is the station at the famous Spanish Steps. 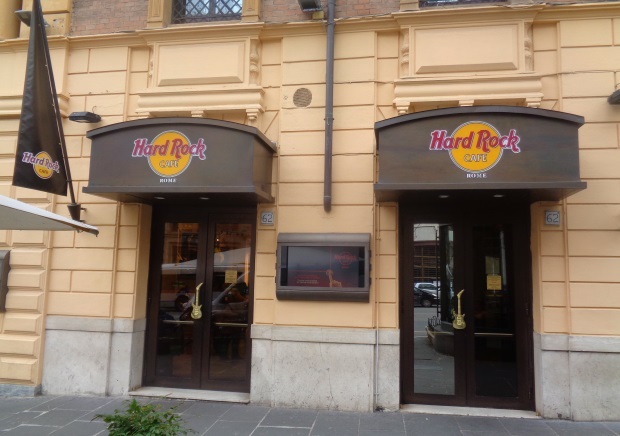 The Hard Rock Cafe Roma is very central, also other big sights like the park Villa Borghese and the fountain Fontana di Trevi are reachable in 10 to 15 minutes on foot. Also in Germany there is a Hard Rock Cafe in Berlin and more in Munich, Hamburg and Cologne. In Austria in Vienna and Innsbruck, in Switzerland there is no branch yet.